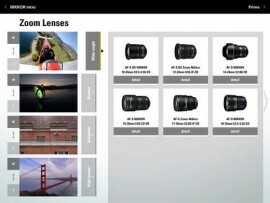 TOKYO - Nikon Corporation is pleased to announce that it has developed and released the "NIKKOR & ACC" app (exclusively for iPad) that introduces NIKKOR lenses for cameras with interchangeable lenses and a variety of accessories. The "NIKKOR & ACC" app can be downloaded free of charge from Apple's App Store. In addition, a short movie has also been released for introduction of the contents of the app. 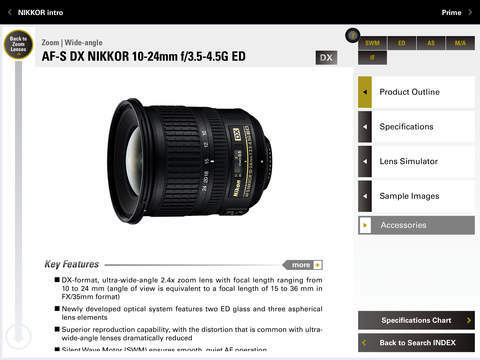 Installing the "NIKKOR & ACC" app makes it possible to download the contents of "Digital Catalog". "Digital Catalog" that includes the entire lineup of NIKKOR lenses* is a convenient app that allows users to search for lenses based on lens type, technology used, specifications and sample images. 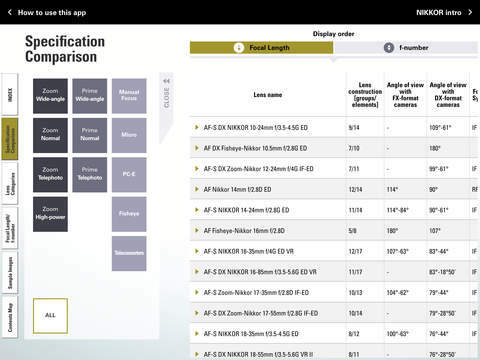 Quick confirmation of lens information helps users who are considering the purchase of new lenses to find those most desired or most appropriate for their purposes. The "Digital Catalog" menu offers 5 items, specifications, lens categories, focal length, f-number, and a variety of sample images shorted by shooting scenes. 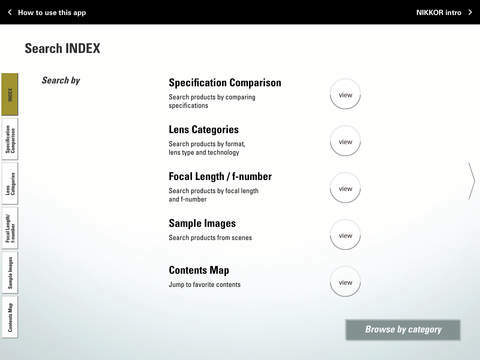 By using these items, users can compare various lenses to find the one most desired. "Contents Maps" that allows users to directly select desired contents of "Digital Catalog" is also available. Added to this are the "NIKKOR Lens Technology" movie that introduces Nikon's representative lens technologies and the "The Optical Masterpiece" movie that demonstrates the high-quality and reliability of sophisticated NIKKOR lenses. 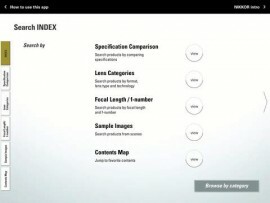 In addition to various information such as lens characteristics, primary specifications, illustration of lens construction, MTF curves, sample images, accessories as well as external design included in the introduction of each lens, focal length and angle of view of the lens are illustrated with sample images for easier understanding. The information necessary to select lenses is richly provided so that information on any NIKKOR lens is readily available to users. 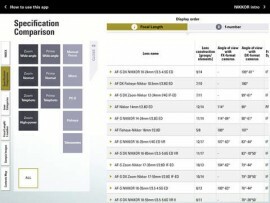 Information on lens basics, NIKKOR lens technology, Speedlights, etc. will be added to the contents of "Digital Catalog" in the future to make this app more informative. 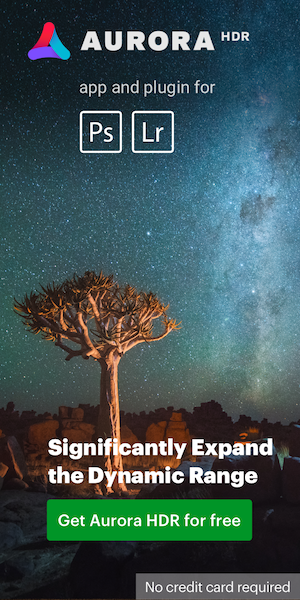 In addition to the "NIKKOR & ACC" app, Nikon plans to create more apps for Nikon imaging products such as an app for Nikon digital SLR cameras. *Chinese will be supported around June 2015. Support for other languages is under consideration. This entry was posted in Nikon Software and tagged Apple, iOS, Nikon iPhone app. Bookmark the permalink. Trackbacks are closed, but you can post a comment.